Diabetic nephropathy (DN) is a relevant, chronic, microvascular complication in terms of morbidity and mortality for patients with diabetes mellitus in Western countries.1 The progression of DN is characterized by an increase in urinary albumin excretion, hypertension, glomerulosclerosis, and an eventual reduction in GFR, leading to ESRD. These functional changes are related to a remodeling of the renal structure, including glomerular and tubular hypertrophy, inflammation, and extracellular matrix accumulation.2 Although hyperglycemia is the driving force for diabetic complications, mounting evidence suggests that dyslipidemia and chronic inflammation are contributory factors to the progression of diabetic kidney disease. In fact, high-glucose conditions lead to activation of inflammatory mediators in glomerular and tubular cells, which triggers leukocyte infiltration, renal cell proliferation, and extracellular matrix expansion.3 Current treatments for diabetic complications based on the integrated control of glycemia, BP, and lipids are insufficient to prevent the progression of CKD in a large proportion of patients1,4,5; as such, there is a clear need for new strategies to slow the decline of renal function in DN. Dysregulated JAK/STAT contributes to the pathogenesis of autoimmune diseases, inflammation, and cancer,12 and also plays an important role in the onset and progression of diabetes and its chronic vascular complications (e.g., nephropathy, retinopathy, neuropathy, and atherosclerosis).5,8,14 Different strategies based on the regulatory role of the SOCS family have been proposed as potential anti-inflammatory therapy for these conditions.13 Accordingly, the present work investigates the renoprotective properties of a cell-permeable peptide mimicking the activity of the SOCS1 KIR region to impair pathologic JAK/STAT activity in a mouse model of DN and in cultured renal cells under diabetic conditions. The therapeutic potential of SOCS1 peptidomimetic was investigated in streptozotocin-induced diabetic and apoE-deficient mice, an experimental model of DN that combines hyperglycemia and hypercholesterolemia, two important risk factors of this disease.15 Biodistribution and pharmacokinetic studies of rhodamine-labeled SOCS1 peptide (administered via the intraperitoneal route) revealed efficient accumulation in kidney (glomerular and tubular localization), spleen, and liver of mice (Supplemental Figure 1, A and B). Maximal fluorescence in plasma and urine were reached at 4 and 6 hours, respectively (Supplemental Figure 1C), with a plasma elimination t1/2 of 4.5 hours (Supplemental Figure 1D). Diabetic mice were treated with SOCS1 peptide (S1 group), mutant inactive peptide (Mu group), and vehicle at either an early (10–16 weeks of age) or later (24–34 weeks of age) disease stage. We first analyzed the time course of STAT1, STAT3, and SOCS1 mRNA expression during the progression of DN. In contrast to the gradual rise in STATs over time, SOCS1 expression showed an initial increase followed by a significant decrease at later stage of DN (Figure 1A). Furthermore, immunohistochemistry to detect the activation status of STAT proteins in the kidney revealed an intense nuclear staining of phosphorylated STAT1 (P-STAT1) and P-STAT3 in glomeruli and tubulointerstitium of diabetic mice receiving vehicle, a significant reduction (approximately 50%) in SOCS1-treated mice (Figure 1, B–D), and also a positive correlation between the two variables in the experimental groups (Supplemental Figure 2). Western blot analysis (Figure 1E) further confirmed attenuated P-STAT1/3 levels by SOCS1 peptide both at early and late treatment stages, whereas the mutant sequence (Mu group) was ineffective. SOCS1 peptide inhibits STAT activation in diabetic kidneys. (A) Stat1, Stat3, and Socs1 gene expression in renal cortex from nondiabetic and diabetic mice in early (aged 16 weeks) and late (aged 34 weeks) disease checkpoints was analyzed using real-time PCR, normalized by 18S endogenous control and expressed in arbitrary units (a.u.). (B–D) Immunostaining of P-STAT1 and P-STAT3 in kidney sections from nondiabetic and diabetic mice (early model). Representative micrographs (B) and quantification of positive cells in glomeruli (C) and tubulointerstitium (D) are shown. Horizontal dotted lines represent the mean values for nondiabetic mice. 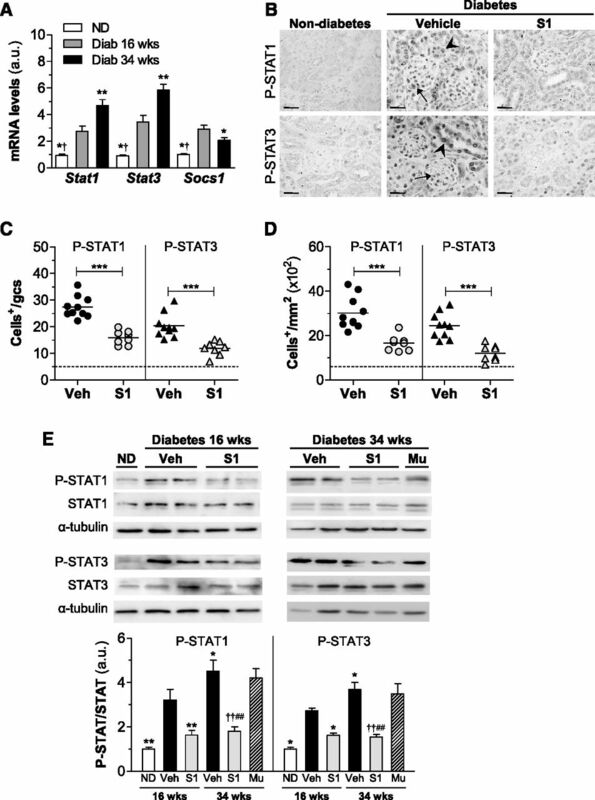 (E) Western blot of P-STAT1 and P-STAT3 in renal cortical lysates in the early and late models of diabetes. Shown are representative images and the summary of normalized quantification, expressed in a.u. Diab, diabetic; ND, nondiabetic; Veh, vehicle. *P<0.05, **P<0.01, and ***P<0.001 versus Veh (16 weeks); †P<0.05 and ††P<0.01 versus Veh (34 weeks); #P<0.05 and ##P<0.01 versus Mu. Original magnification, ×200 in B.
Diabetes was associated with a progressive renal decline, as demonstrated by an increased urine albumin-to-creatinine ratio (UAC; Supplemental Figure 3, B and C) and serum creatinine (Table 1). These parameters were significantly improved in S1 groups compared with respective vehicle groups both at early and late treatment stages, with percentages of decrease ranging from 33% to 42% (Figure 2A, Table 1). SOCS1 peptide also ameliorated kidney/body weight ratio (Table 1) and the renal expression of kidney injury molecule-1 (Figure 2B). By contrast, no significant differences were observed between the vehicle and Mu groups, thus excluding any off-target effects. Neither early nor late treatments affected hyperglycemia (blood glucose and glycated hemoglobin), lipid profile, or body weight in diabetic mice (Supplemental Figure 3, D–G, Table 1). Furthermore, no signs of toxicity or hepatic or splenic damage were observed in the treated groups (not shown). SOCS1 peptide protects from diabetes-associated renal injury in apoE-deficient mice. (A) Albuminuria levels in apoE-deficient mice at early (age 16 weeks) and late (age 34 weeks) diabetes. (B) Gene expression of kidney injury molecule (Kim-1) in renal cortex was analyzed by real-time PCR, normalized by 18S endogenous control, and expressed in arbitrary units (a.u.). (C) Representative images of PAS-stained kidney sections from mice in the early (age 16 weeks; a–c) and late (age 34 weeks; d–f) diabetes models: nondiabetes (a), diabetes+vehicle (b and d), diabetes+S1 (c and e), and diabetes+Mu (f). Diabetic mice exhibited glomerular hypertrophy/PAS+ area expansion (arrows) and tubular atrophy/glycogen deposition (arrowheads). Milder damage was observed in S1 groups. (D) Glomerular area quantification in the experimental groups. (E) PAS+ mesangial area analysis. Veh, vehicle. *P<0.05, **P<0.01, and ***P<0.001 versus Veh (16 weeks); †P<0.05 and †††P<0.001 versus Veh (34 weeks); #P<0.05 and ##P<0.01 versus Mu. Horizontal dotted lines represent the mean values for nondiabetic mice in A, B, D, and E. Original magnification, ×200 in C.
Histologic assessment of periodic acid–Schiff (PAS)–stained kidney samples revealed that SOCS1 peptide attenuated several morphologic changes within the glomerulus (hypercellularity, mesangial matrix expansion, and capillary dilation), tubules (atrophy and degeneration), and interstitium (fibrosis and inflammatory infiltrate) of diabetic mice (Figure 2C, Table 2). Digital quantification further confirmed that SOCS1 intervention decreased glomerular size (percent reduction versus vehicle: 16 weeks, 41±2; 34 weeks, 36±3; Figure 2D) and PAS+-mesangial area (percent reduction: 16 weeks, 51±4; 34 weeks, 33±6; Figure 2E). Furthermore, Pearson test showed significant correlations between P-STAT1/P-STAT3 levels and indicators of renal damage (Table 3). Overproduction of extracellular matrix is a hallmark of DN and leads to glomerular sclerosis and interstitial fibrosis.5,16 Analysis of picrosirius red staining (Figure 3A) in diabetic kidneys revealed a progressive accumulation of collagen in glomeruli and tubulointerstitium. 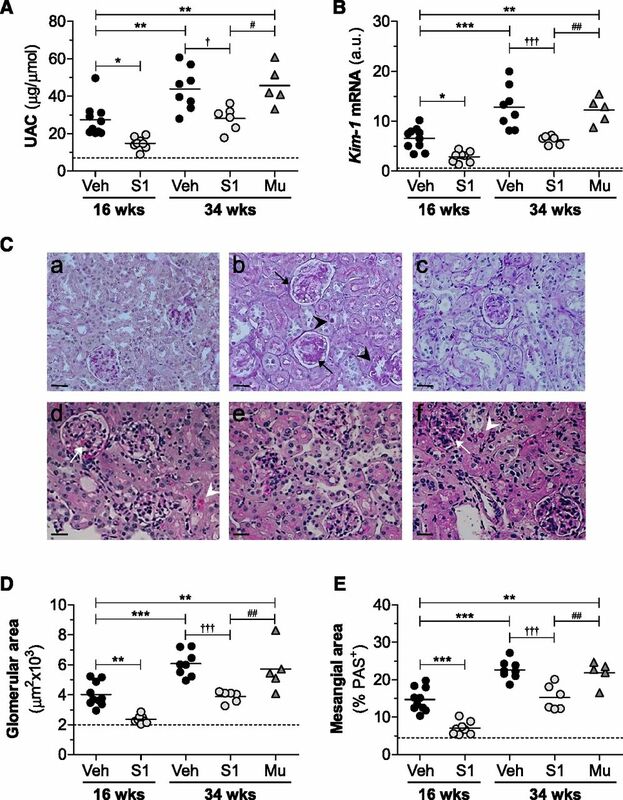 Furthermore, S1 groups of diabetic mice exhibited a 44%–38% reduction (P<0.01) of renal fibrosis over time compared with age-matched vehicle mice, whereas mutant peptide had no antifibrotic effect (Figure 3, A–C). Accordingly, SOCS1 peptide attenuated the mRNA (Figure 3D) and protein (Figure 3E) expression levels of fibrotic markers (type I collagen, fibronectin, and TGFβ), which positively correlated with P-STAT1/3 activation (Table 3). Effect of SOCS1 peptide on diabetes-induced renal fibrosis. (A) Representative images of picrosirius red–sensitive collagen staining in renal sections from mice in the early (age 16 weeks; a–c) and late (age 34 weeks; d–f) diabetes models: nondiabetes (a), diabetes+vehicle (b and d), diabetes+S1 (c and e) and diabetes+Mu (f). Quantification of fibrosis (% picrosirius red area) in glomerular (Glom.) (B) and tubulointerstitial (TI) (C) compartments. Horizontal dotted lines represent the mean values for nondiabetic mice. (D) Real-time PCR analysis of type I collagen (Col I), fibronectin (Fn), and Tgfβ in renal cortex. Normalized values are expressed in arbitrary units (a.u.). (E) Western blot analyses of fibronectin (FN) and TGFβ expression in renal cortical lysates from diabetic mice. Shown are representative blots and the summary of normalized densitometric quantification. Bars represent the mean±SEM of 5–10 animals per group. Veh/V, vehicle. *P<0.05 and **P<0.01 versus Veh (16 weeks); †P<0.05, ††P<0.01, and †††P<0.001 versus Veh (34 weeks); #P<0.05 and ##P<0.01 versus Mu. Original magnification, ×100 in A. The induction of diabetes was associated with the recruitment, retention, and activation of leukocytes in mouse kidney, as evidenced by increased expression of leukocyte markers and proinflammatory genes (Figure 4). SOCS1-treated mice exhibited a significant reduction (approximately 50%) in the number of infiltrating CD3+ T lymphocytes and F4/80+ macrophages (Figure 4, A–C), in good correlation with STAT activation levels (Table 3). Furthermore, peptide treatment decreased the gene and/or protein expression levels of monocyte and T cell chemokines (CC chemokine ligand [CCL] 2 and CCL5) and cytokine TNFα in diabetic kidneys (Figure 4, D and E). SOCS1 peptide decreases inflammation in diabetic mice. (A–C) Histologic analysis of T lymphocytes and macrophages in kidney sections from diabetic mice (early model). (A) Representative micrographs. Quantification of CD3+ and F4/80+ cells in glomeruli (B) and interstitium (C). Horizontal dotted lines represent the mean values for nondiabetic mice. (D) Real-time PCR analysis of inflammatory genes in renal cortex. Normalized values are expressed in arbitrary units (a.u.). (E) Kidney chemokine levels measured by ELISA. (F) Gene expression levels of arginase isoforms (ArgII and ArgI) in diabetic kidneys. Real-time PCR data normalized by 18S are expressed in a.u. (G) Representative immunoblots and summary of the relative levels of ArgII and ArgI protein expression in renal lysates from diabetic mice. (H) Flow cytometry analysis of relative CD115+ monocyte population (Ly6Chigh and Ly6Clow) in peripheral blood. Bars represent the mean±SEM of 5–10 animals per group. Veh/V, vehicle. *P<0.05, **P<0.01, and ***P<0.001 versus Veh (16 weeks); †P<0.05 versus Veh (34 weeks); #P<0.05 versus Mu. Original magnification, ×200 in A. To further evaluate whether SOCS1 peptide modulates the functional stage of kidney macrophages, expression levels of arginase isoforms (ArgII and ArgI) were analyzed to distinguish between proinflammatory M1 and anti-inflammatory M2 phenotypes, respectively. 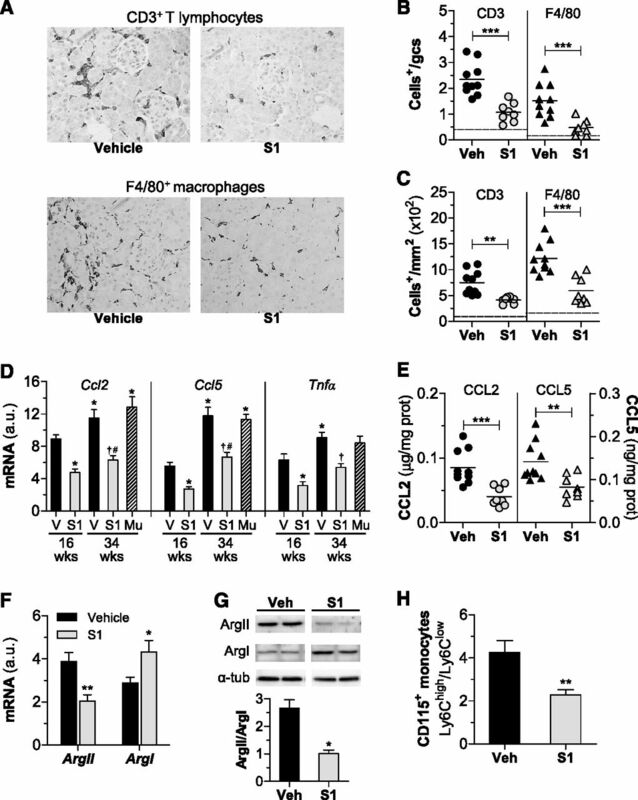 Both macrophage phenotypes are present in diabetic kidneys, ArgII (M1) being the most abundantly expressed in the vehicle group and ArgI (M2) the predominant macrophage marker in the S1 group (Figure 4, F and G). Consistently, SOCS1-treated mice displayed a decreased Ly6Chigh/Ly6Clow ratio of circulating monocytes (Figure 4H). To corroborate the experimental model we assessed, in vitro, the effect of SOCS1 peptide on murine mesangial cells (MC), tubuloepithelial cells (MCT), and macrophages stimulated with either inflammatory cytokines (IFNγplus IL-6) or high-glucose concentrations (HG) in an attempt to mimic the diabetic milieu. Efficient cytoplasmic uptake of rhodamine-labeled peptide was visualized via confocal microscopy (Supplemental Figure 4). Internalized SOCS1 peptide, but not the Mu sequence, further inhibited phosphorylation (Figure 5, A and B) and nuclear translocation (Supplemental Figure 4) of STAT1/3, and also prevented proinflammatory and profibrotic gene expression (Figure 5, C and D, Supplemental Figure 5A) in renal cells exposed to diabetic stimulation. Likewise, SOCS1 peptide attenuated the secretion of CCL2, CCL5 (Figure 5E, Supplemental Figure 5B), and fibronectin (Figure 5F) induced by cytokines in renal cells. In these experiments, the inhibitory effect of SOCS1 peptide was very similar to that observed after the silencing of STAT1 with specific small interfering RNA, used as positive control (Supplemental Figure 6). SOCS1 peptide inhibits STAT activation and target gene expression in vitro. 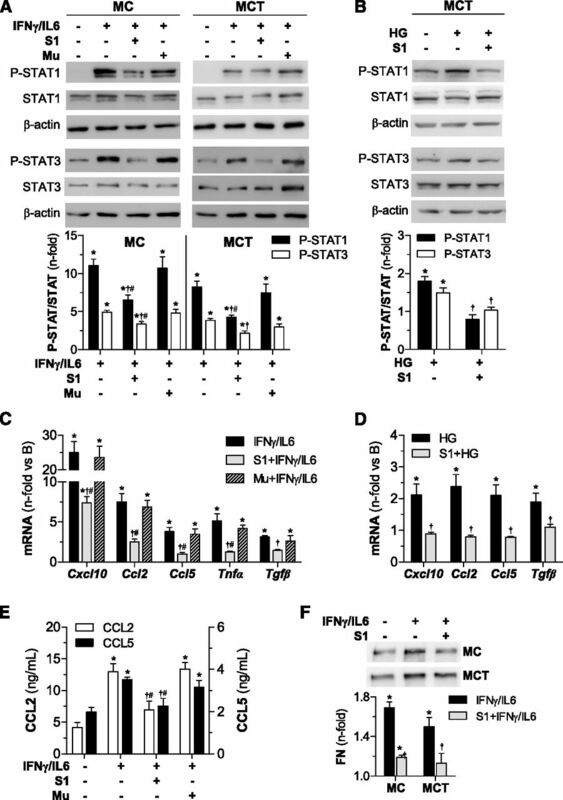 Western blot analysis for P-STAT1 and P-STAT3 proteins in total cell extracts from MC and MCT stimulated with cytokines (60 minutes) (A) and HG (6 hours) (B) in the presence or absence of peptides (100 μg/ml). Representative immunoblots are shown and densitometry data expressed as fold increases over basal conditions (arbitrarily set to 1). Real-time PCR analysis of indicated genes in MCT at 24 hours of stimulation with cytokines (C) and HG (D). (E) CCL2 and CCL5 concentrations in MC supernatants measured by ELISA. (F) Western blot of fibronectin (FN) levels in culture supernatants. Bars represent the mean±SEM of 4–7 independent experiments. *P<0.05 versus basal; †P<0.05 versus stimulus; #P<0.05 versus Mu. To evaluate the functional consequences of inflammatory gene reduction, we next examined the effect of SOCS1 peptide on cell migration, proliferation, and differentiation—important processes involved in renal damage during DN. In vitro wound-healing assay with MC demonstrated the antimigratory effect of SOCS1, but not mutant peptide (Figure 6A). SOCS1 peptide was also able to prevent the mitogenic effect of cytokines (Figure 6, B and C) and high-glucose levels (Figure 6D) on renal cells, without affecting cell viability. 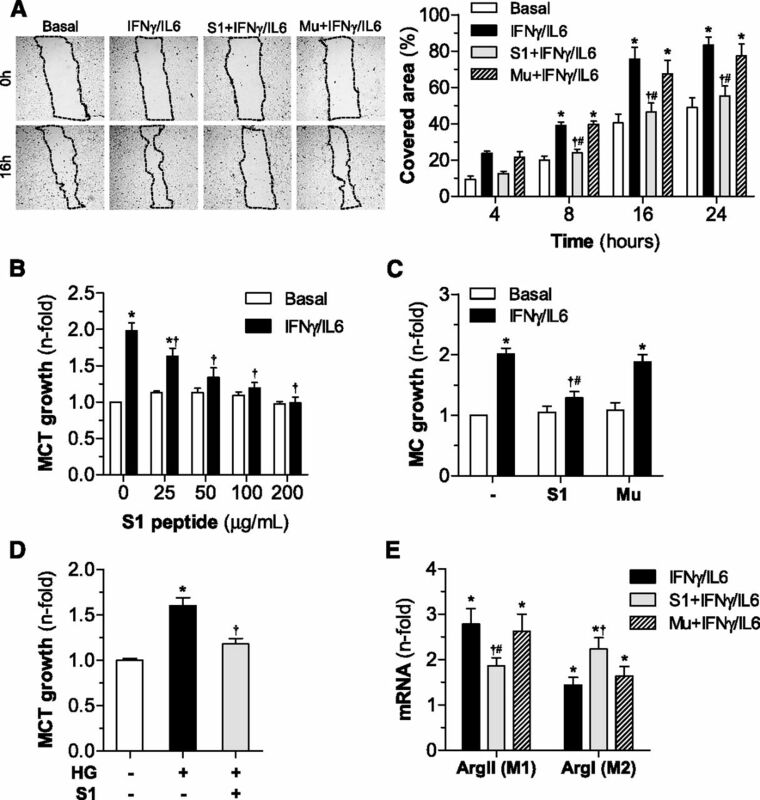 Furthermore, in cytokine-induced macrophages, SOCS1 peptide inhibited M1 in favor of M2 phenotype, as evidenced by significantly downregulated ArgII and increased expression of ArgI (Figure 6E, Supplemental Figure 5C). In vitro effects of SOCS1 peptide on cell migration, proliferation, and differentiation. (A) Analysis of MC migration by scratch-wound-healing assay. Representative phase-contrast images of cells migrating into the wounded area (dotted lines) at 0 hours and 16 hours of cytokine incubation in the absence or presence of peptides (S1 and Mu sequences, 100 μg/ml). The graph shows the results from quantification of covered healing areas over time. (B) Dose-dependent curves of peptides on cell viability (basal conditions) and proliferation (cytokine stimulation) in MCT (MTT assay, 48 hours). (C) Effect of peptides (100 µg/ml) on MC growth. (D) Antiproliferative effect of S1 peptide on HG-stimulated MCT. (E) Real-time PCR analysis of arginase isoforms (ArgII and ArgI) in bone marrow–derived macrophages. Data expressed as percentage or fold increases over basal conditions are mean±SEM (n=4–6 experiments). *P<0.05 versus basal; †P<0.05 versus stimulus; #P<0.05 versus Mu. Delaying the progression of nephropathy toward end-stage renal failure remains a primary goal in the treatment of diabetes. Beyond current therapies with limited improvement of renal function,1,4,5 novel approaches involving the inhibition of pathologic factors and the promotion of protective/reparative mechanisms are of clinical interest. Herein, we report that a peptide mimicking the endogenous regulatory protein SOCS1 counteracts DN with overactive JAK/STAT signaling by reducing renal inflammation and fibrosis, manifested by an improvement in albuminuria and renal function. Different SOCS-like molecules have been reported to dampen cytokine receptor activities and further downstream signal transduction events in cancer cells, leukocytes, keratinocytes, and smooth muscle cells.20,36–40 In vivo, SOCS-derived peptides improve outcome in experimental multiple sclerosis, peripheral nerve injury, and infection.35,36,38–40 Likewise, and consistent with our previous findings on the atheroprotective effect of SOCS1,20,41 this study demonstrates that a SOCS1 peptidomimetic suppresses STAT1/3 activation in diabetic kidneys and retards development and progression of experimental DN. These effects occur independently of improved glucose control and lipid profile, suggesting the use of SOCS1 peptide in diabetic complications rather than in the disease process. Evidence indicates a complex role for SOCS family in the pathophysiology of diabetes. In type 1 diabetes, SOCS1 overexpression improves hyperglycemia-induced β cell damage and prevents diabetes development in nonobese mice.45,46 In type 2 diabetes, SOCS1 protects mice against systemic inflammation47 and prevents high fat–induced insulin resistance48 but, paradoxically, SOCS1 inhibition ameliorates insulin resistance and metabolic syndrome in obese diabetic db/db mice.49 It has been reported that SOCS1 can disturb insulin signaling by targeting receptor and adapter proteins for proteasomal degradation, thus contributing to glucose intolerance and insulin resistance.50 Unlike whole protein, our SOCS1 peptide lacks the conserved SOCS box required to promote degradation of insulin-signaling proteins, which may explain its renoprotective effect in diabetic mice without affecting glucose metabolism. 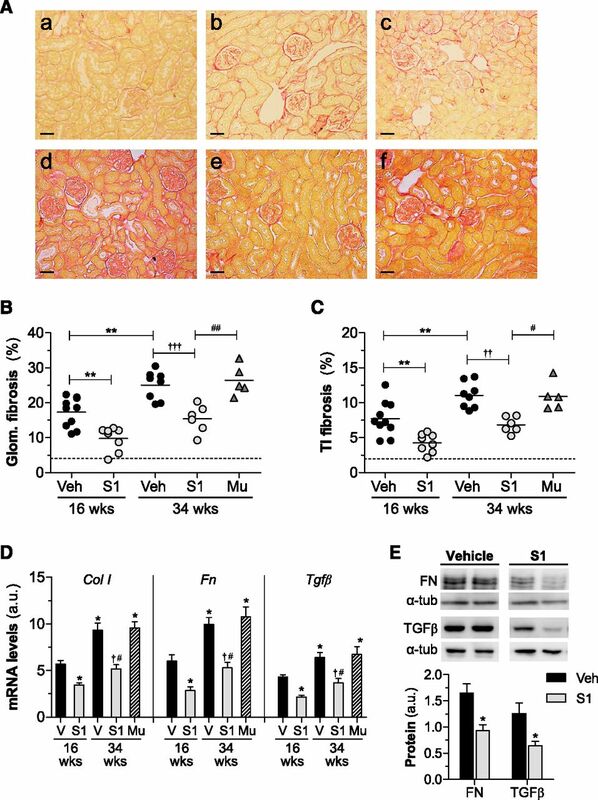 Collectively, this study emphasizes the pivotal role of the JAK/STAT/SOCS axis in regulating proinflammatory and profibrotic factors in the diabetic kidney, and proposes SOCS1 peptidomimetic as a useful approach to dampen renal inflammation and fibrosis, thus decreasing albuminuria and preserving renal function during the course of DN. A complete description of the methods are available in Supplemental Material. Animal studies conformed to the Directive 2010/63/EU of the European Parliament and were approved by the Institutional Animal Care and Use Committee (IIS-Fundacion Jimenez Diaz). Diabetes was induced in male apoE-deficient mice by consecutive intraperitoneal streptozotocin injections (125 mg/kg per day for 2 days).15,41 Diabetic mice (glycemia ≥19.4 mmol/L) were randomized to receive vehicle (n=18), SOCS1 peptide (n=14), or mutant inactive peptide (n=5) intraperitoneally once every second day for a total of 6–10 weeks starting at 10 weeks of age (early treatment) or at 24 weeks of age (late treatment) (Supplemental Figure 3A). Age-matched nondiabetic mice (n=5) were used as controls. At the end of the study, blood samples were collected for biochemistry and flow cytometry; urine samples for UAC calculation; and dissected kidneys for histology, RNA, and protein expression. Histologic scoring (0–3 scale), glomerular size, and mesangial area were quantified in PAS-stained paraffin sections. Collagen content was examined by picrosirius red staining. Macrophages (F4/80), T lymphocytes (CD3), and STAT proteins were detected by immunoperoxidase. Positive staining was expressed as percentage of total area and number of positive cells (per glomerular cross-section [gcs] or per mm2). Results are presented as individual data points and mean±SEM of duplicate/triplicate determinations. Differences across groups were considered significant at P<0.05 (ANOVA with the Bonferroni post hoc test). Pearson correlation analyses were performed for normally distributed parameters. C.G.G. and J.E. are inventors on a patent application regarding peptide. The other authors declare no conflict of interest. The authors greatly acknowledge the initial contributions of Dr. B. Mallavia and J. Calavia (Fundacion Jimenez Diaz University Hospital-Health Research Institute) to the animal models and cellular studies. We also thank Dr. L.M. Blanco-Colio and V. Fernandez-Laso for their help with silencing experiments. C.R. and C.G.G. designed the study, researched and analyzed data, and wrote the manuscript. I.L. and A.O. designed the experiments, analyzed data, and critically revised the manuscript. L.L.S. and S.B. evaluated in vivo and in vitro data. J.E. and J.B. analyzed or interpreted data and reviewed the manuscript for intellectual content. C.G.G. is the guarantor of this work. This work was supported by the Spanish Ministry of Economy and Competitiveness (SAF2012-38830, SAF2015-63696-R), European Regional Development Fund-Ministry of Health (PI14/00386, PIE13/00051), a European Union–funded program (“KidneyConnect”), the Iñigo Alvarez de Toledo Renal Foundation, the Conchita Rabago Foundation, and the Spanish Societies of Nephrology and Arteriosclerosis. The results included in this paper are under the protection of a patent issued by our institutions (Fundacion Jimenez Diaz University Hospital-Health Research Institute and Autonoma University of Madrid). I.L. and A.O. contributed equally to this work. This article contains supplemental material online at http://jasn.asnjournals.org/lookup/suppl/doi:10.1681/ASN.2016020237/-/DCSupplemental.